The CourierBag Deluxe holds approximately 40 records or 35 when a laptop is inside. The CourierBag Deluxe is build with firmness in mind and can be combined with any UDG trolleys. The bag is also perfect for daily use as a schoolbag or to take to your work. It has loads of compartments and features. Featuring: An inner 15.6 inch laptop bag which comes for free, a detachable phone pocket and is equipped with a strong velcro fasten. The bag comes with a comfortable shoulder strap which can be adjusted to the perfect fit and a handle with rubber grips that provides comfort and durability. Extras: Detachable phone pocket on the side. Water bottle holder on the side. Slides over any trolley bag. Top carry handles. 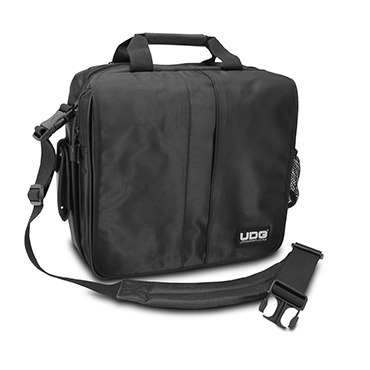 UDG Headphone Bag can be buckled. Fits: Approximately 45 records or 35 records when 15" laptop inside, or various smaller controller, or Audio interface. Buckles up a UDG Headphone bag.